Light infiltrates a forest. Its fingers spreading wider as it turns from spotlight to flood. What began as just a small reveal soon illuminates everything. That’s how light works if we let it in. Brightness beams its way into each day. We may not always see or sense it if our eyes or soul are dulled. God sends His presence forth in rain and thunder, blaze of creation’s beauty and soft foggy breath of subdued sunlight. There isn’t a place, space or person that can remain permanently indifferent to His penetrating, laser-light gaze. Light will find a way to penetrate our days. The tiniest crack in the surface of things becomes an opening to grace. God loves us too much to leave us alone to stew in our situations, or become derailed by challenging circumstances. As our loving heavenly Father, He cares tenderly and compassionately about how His children are and how we feel. I’ve been laid low lately with increasing physical and mental health challenges. It’s still hard at times to see the positive. Each day is a fight to choose joy. 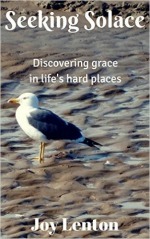 To choose hope over despair, courage to go on instead of discouragement to grind to a halt. Being mortal can seem like a burden on days when I yearn for a life beyond the one I am living. Maybe you’ve been there too? But God… – two of the most important words in the universe – reminds me that you and I are birthed for a reason, here for such a time as this, destined for a purpose we can barely sense or taste the fullness of even as we’re living it. All God asks is that we allow His Light and Love admittance, one small sliver at a time, letting it warm our hearts, restore gratitude and illuminate the path before us. As God shines His goodness and grace into our hearts we begin to see how our very weakness and brokenness, the cracks in our earthly existence, are the means by which He enters in. So there is hope for us all. How is God revealing Himself to you in this season? What helps to keep you stable in life’s storms? Your poem is beautiful. I love that the smallest beam of light can cut through the darkness and “the tiniest crack in the surface of things becomes an opening to grace.” And those are the two most beautiful words: “But God”. Praying that you know his light giving you hope today. Glad to be your neighbour at Tell His Story. “As God shines His goodness and grace into our hearts we begin to see how our very weakness and brokenness, the cracks in our earthly existence, are the means by which He enters in. So there is hope for us all.” AMEN! Joy, I love your poem! It’s beautiful! Amen, Tara! No matter how dark our circumstances may seem, God’s light will always penetrate and overcome the darkness. I’m glad you’re also a Leonard Cohen fan! He’s a fabulous poet. Bless you, friend. I love the images you use in this poetry. It is so true that we expect and want a road to Damascus experience when He provides that tiny sliver of light that we have to look for. Only by stillness and quiet does this light become known. Thank you for your words! I understand lack of energy, etc. My body and I fight severe food and environmental allergies, arthritis in both knees, and asthma. IBS was in the mix until early May. I pray the probiotic continues to work. Chronic anything is certainly a challenge. Joy, I’m sorry to hear of your health struggles. It must be very challenging and draining for you. You are right when you say. “Chronic anything is certainly a challenge” because the word ‘chronic’ itself denotes a long standing or constantly recurring condition, both of which are extremely wearying on mind and body. It definitely feels like a battle most days. Thanks for sharing your own story. I get intermittent spells of IBS and have found daily probiotics helpful. I’m also afflicted with arthritis, so I understand how debilitating and painful it can be. I am praying for you to have some respite and for the appropriate treatment to succeed in making you feel a bit stronger. Blessings. Joy, sorry to be out of touch. We’ve just returned from a six-week sojourn. I am glad to have an updated sense of how I can “come alongside,” albeit long-distance, in prayer. May strength and the gift of equanimity guard and heal and keep you today. Ill and beset as you feel, your writing, as ever, radiates love and beauty, fills my imagination. No problem, Laurie. As you can see, I haven’t exactly been very active here! Most of my writing has slowed down considerably recently, although I still try to write a weekly post at Words of Joy. Things are extra challenging this week because my beloved is in hospital trying to recover from spinal surgery. I not only miss him terribly, I also struggle to cope home alone with things he normally helps me with. And more energy is currently diverting to daily tasks rather than connecting via social media or blogs. It really hits home that I only have the strength and space to write when other needs are taken care of! Oh dear, renewed prayers forthcoming, for you and your man (whom I so enjoyed reading about in one of your posts). May he recover well and soon, and may you continue to find the pace that suits the current challenges and opportunities. Take care, dear Joy!